Happy New Year Mr Reynolds! Hope you had a great Christmas. Mr.R. ! 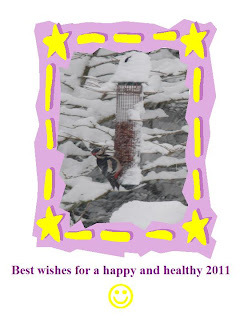 A Greater Spotted Woodpecker -- nice! Hey Al, good to see you back over the e-ther. Hope you enjoyed your stay in Australia. Have a good X-mas? It was cool to finally meet and your wife at Aussiecon4. Still think about it often. PS: Am I the only person that's noticed that this Greater spotted Woodpecker seems to be pecking at a very large Pecker?